It’s that time of year again. BBC Sports Personality of the Year. At least this year they managed to put in women and disabled people. You can look at the various betting websites to find the odds easily enough but I want to say who I think should deserve to win. I have only a slight bias towards runners despite being the5krunner. MY criteria are that the person is truly world class (OK that’s most of them to be fair), has achieved world class performances, is an athlete (not just a sportsperson) and actually appears to have a personality. Ellie Simmonds: Almost, sorry Ellie. Heather Watson: Sorry Tom will beat you in the Junior event. Alistair Brownlee: I cheered you to victory but sorry. Jodie Williams: Sorry Tom will beat you…your time will come. So here is my longlist. I have to say I would really want Victoria Pendleton to win but it’s not going to happen and I’m afraid your appearance on Strictly hasn’t helped. There can only be one cyclist who goes through tot he short list. Bradley Wiggins: Must be the best cycling achievement ever (certainly in 2012) by a Brit. The pedigree is there as well. 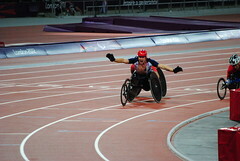 David Weir: Yep he qualifies for round 2 ( plus I can beat you round Richmond Park (on my bike). Great backstory. Chris Hoy: I think Bradley edges it as his sideburns give him extra personality despite the pedigree. Jason Kenny: Bradley edges it as his sideburns give him extra personality. Maybe next time. Victoria Pendleton: Bradley edges it as his sideburns give him extra personality. Do a Rebecca Romero and we’ll see about next time. So it’s Mo, Weiry or Wiggo. I made my kids do about Mo in their school project but sorry Mo, I’ve done the Mobot and so have my kids, but that is your downfall. It’s fun but not cool. You’re out. Weir or Wiggo? It’s a hard call for me. I got more enjoyment out of watching Weir on TV but I was in the crowds who cheered Wiggo to victory at Hampton Court Palace. And of course winning the the Tour de France with no drugs has to be a first. Shame that the team didn’t get Cav to Road Race victory. So I find it hard to say. David Weir WON’T win it but I think he should. So, despite Cav winning it last year, Wiggo you get the5krunner’s nod. SPOTY 2012.